Spring is in the air...or at least it is here in Montana. And that is an unusual thing to be able to say. Usually spring in Montana is my least favorite season of the year because it usually just means more snow. But, this year we have had spring weather--wind, sun, 50's and 60's. And while our low snow pack does not bode well for fire season, I am loving experiencing a "real" spring. Today, it was time to SPRING UP! the mantel. My mantel is narrow and can't handle too much so I definitely kept it simple. 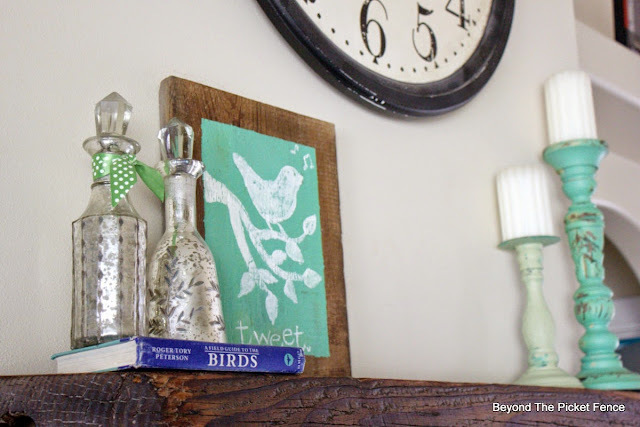 A couple candlesticks, a bird book, two mercury glass cruets, and a sweet, tweet sign. The sign was very quick to make. 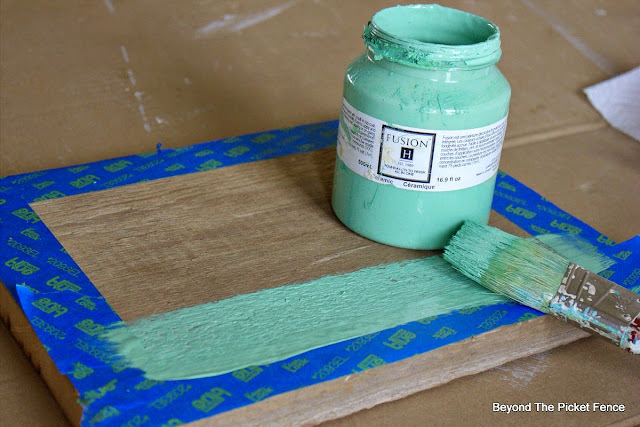 I started by taping the edges of a small scrap of barnwood. I painted inside the tape "frame" with Fusion Mineral Paint. When it was dry (and it dries quickly! ), I chalked a simple design--it is hard to see in this picture. 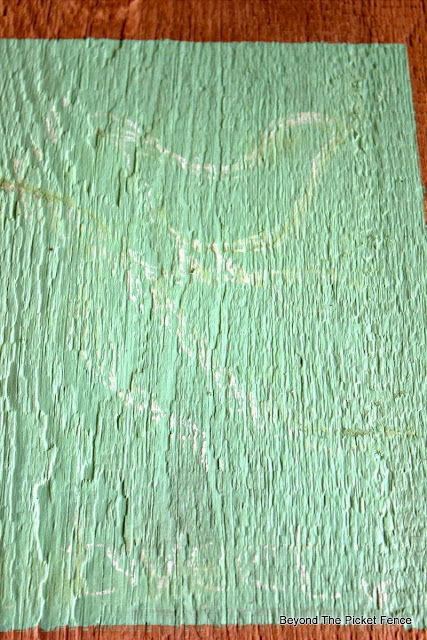 I painted it with white paint, hand sanded very lightly, and used coconut oil over all of it. to finish and darken the wood a bit. 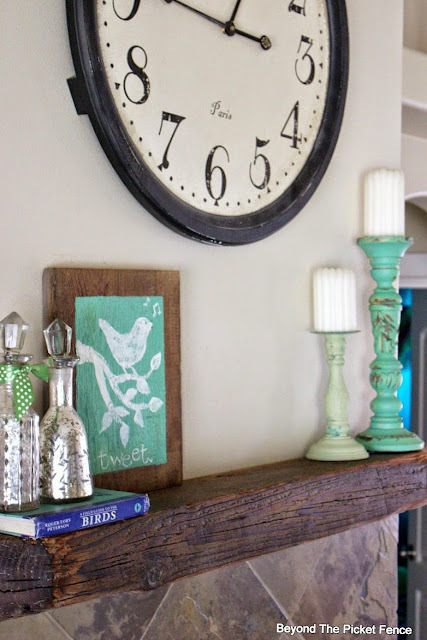 Quick, simple, and just the touch of spring my mantel needed. Thanks Susan, I think it is my new favorite. very cute. My nickname is "Bird" so I'll have to make something like this. Looks great. I think everyone is ready for spring. Your little bird picture is cute. I like how you "framed" it. I don't think I would have thought to do that. Thanks Rebecca--yes this a quick, cheater frame I use a lot! Glad you are getting some spring! You are such a great artist, I couldn't free hand things like that! Cute! 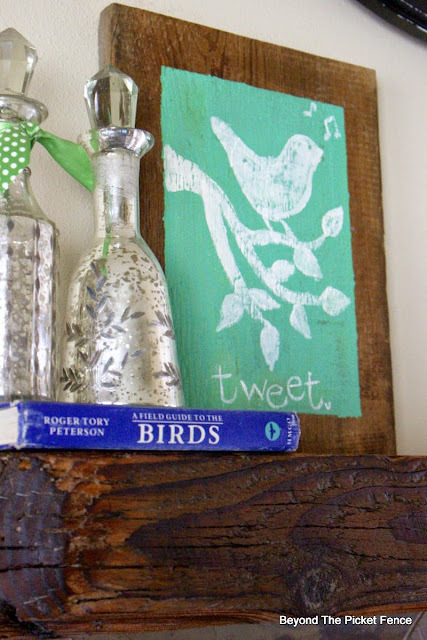 You can use stencils. I was always a doodler, who transferred who doodling to paint. Your little bird painting is so cute. 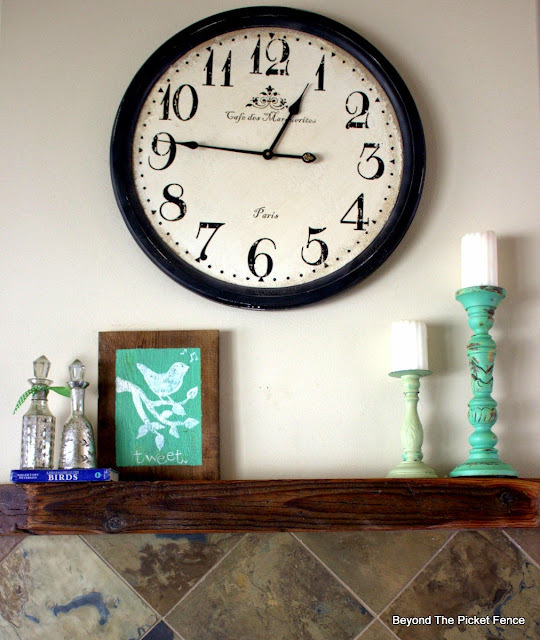 Love your mantel. I am sure it is a challenge with being narrow, but you have it looking very pretty. Thanks for co-hosting VIP ... so much fun. Hope to get around to visiting a lot of blogs. I need to be inspired. So simple, so sweet. Love the color! Where did you get the paint? I have the same narrow mantel...probably a good thing or I would have a ton of junk on it....ha! Cute and springy! Love the color you chose. I have a narrow mantle too. I should do something like this.